It's been 50 years since Dylan went electric at the Newport Folk Festival, and his 1964 Sunburst Fender Stratocaster travelled to Rhode Island over the weekend to be part of the festivities. On July 25th, 1965 Bob Dylan plugged in the electric guitar, backed by the Paul Butterfield Blues Band, and ripped into "Maggie's Farm," "Like A Rolling Stone," "Phantom Engineer." Folk purists were aghast, many others cheered. America's singer songwriter turned into a counterculture rock star before their eyes. The guitar itself has had an interesting journey after the show. Dylan left it on the plane following Newport in 1965. The pilot, Victor Quinto, found the instrument and attempted to return it but eventually gave it to his daughter in New Jersey. Dawn Peterson auctioned it off at Christie's in 2013 for $965,000 to Indianapolis Colts owner Jim Irsay. It was Chris McKinney, the curator of Irsay's rare guitar collection, who brought the guitar back to Newport for this weekend's festival. This morning the fine people @newportfolkfest handed me the very guitar Dylan used to go electric. Nobody had played it since, until today. My entire being went electric. 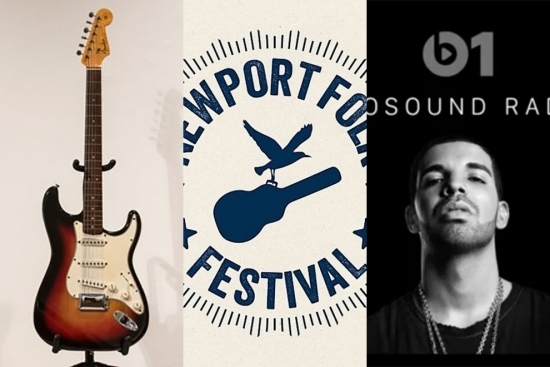 Newport Folk Festival was full of surprises this weekend. Roger Waters of Pink Floyd headlined Saturday night backed by My Morning Jacket (who also did a surprise set earlier in the day). They were joined on stage by Amy Helm (daughter of the late Levon Helm), fiddler Sara Watkins, SNL guitarist G.E. Smith, and Lucius. The set was mainly acoustic with a number of Pink Floyd tunes, a new track on which Waters plays piano for the first time in public, and a Bob Dylan cover.